One down, four more to go. I have posted 5 proposals on Donors Choose in hopes to get 5 Kindle Fires, screen protectors, and cases in time for this upcomming school year. One has already been funded and another is down to just $96. 1. I seperated the Kindle Fires into seperate, smaller, projects. Smaller projects get funded faster. 2. I checked out the Partner Funding Opportunities and geared my proposals to fit the guidelines to receive those. For example, various companies are offering help with funding financial literacy projects, so I geared my projects towards those. Check back often to see what new opportunities are available. The list is frequently updated. 3. Try to think of a snappy title like: Spark a Fire & Inspire Us to Develop Financial Literacy (notice how I also include Financial Literacy in hopes to draw attention from the Partner Funding Opportunities.) Make your title interesting enough that someone will be drawn to click on it and check it out. 4. Shorten the length of your proposal to expire in a few weeks, rather than a few months. Why? So that your proposal will show up first when someone is searching for one to donate money to. 5. Spread the word. Share your project on Facebook, Pinterest, through email, on your blog. You never know when the right person is going to stumble across your idea and decide to help out. If you are questioning whether or not Donors Choose is for you I strongly encourage you to try it out. I have had thousands of dollars of classroom materials donated to my classroom through the site. Materials that I would never have been able to purchase myself without the thoughtful donations from others. Donors Choose is quick and simple. They provide step by step instructions for how to submit a project and they offer examples of what to write. Worried about what will happen if your proposal is funded over the summer? Worry not! They will hold off on shipping you the materials until your school is back in sesssion. You can view my proposals on Donors Chooose here. So what are you waiting for? Try Donors Choose NOW! Oh, and one more thing. 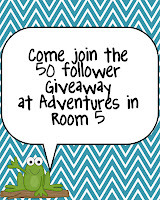 Cassandra from Adventures in Room 5 is having her first giveaway. Check it out and help her reach 50 followers! I just nominated you for the Versatile Blogger Award. Stop by to get it. I have never used Donors Choose but have heard of it before. Thanks for the info!